Thankfully, we’re more committed than ever to being organized this year. I already have plans for what I’m going to do as far as decorating next year, which made boxing everything up so much easier. 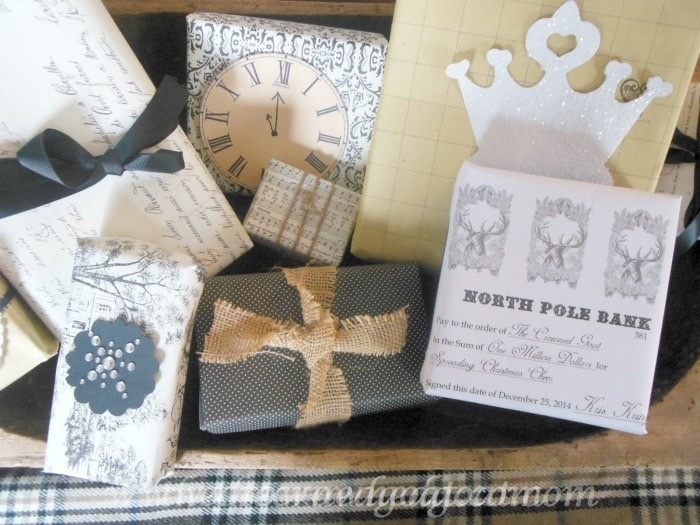 When its time to decorate for Christmas 2015 instead of looking for the box that says “gingerbread ornaments” I will be looking for the box that says “Gingerbread Kitchen 2015” because I know it will have all of the holiday elements I need to pull the kitchen together tucked inside. I’ve never tried it this way before so I’ll keep you posted on how it all works out. 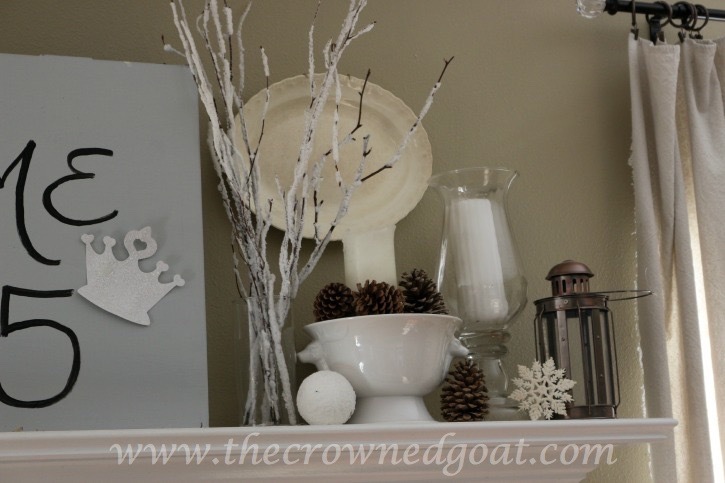 I’ve made a few easy transitions from Christmas décor to winter décor that I wanted to pass along. I know the holiday decorations need to come down but I don’t want to give up the excitement of snuggling up under a warm blanket to read a magazine, having a cup of hot cocoa by the fire or relaxing with popcorn and a movie. 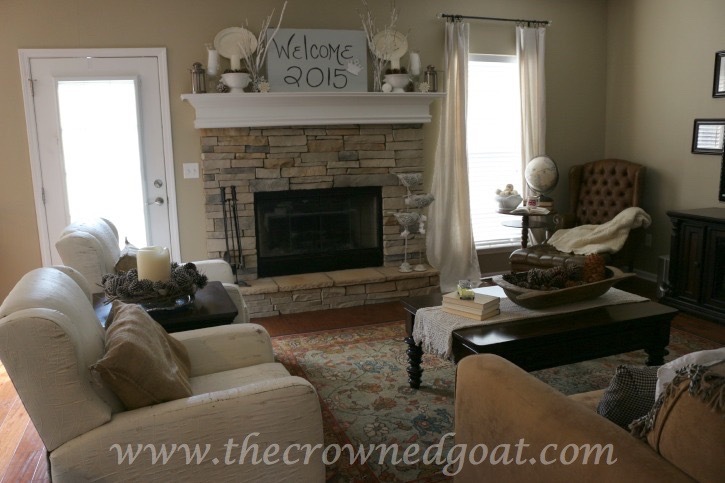 Here are a few easy ways I changed things up without losing all of the elements I love about winter. and this is my winter mantle. 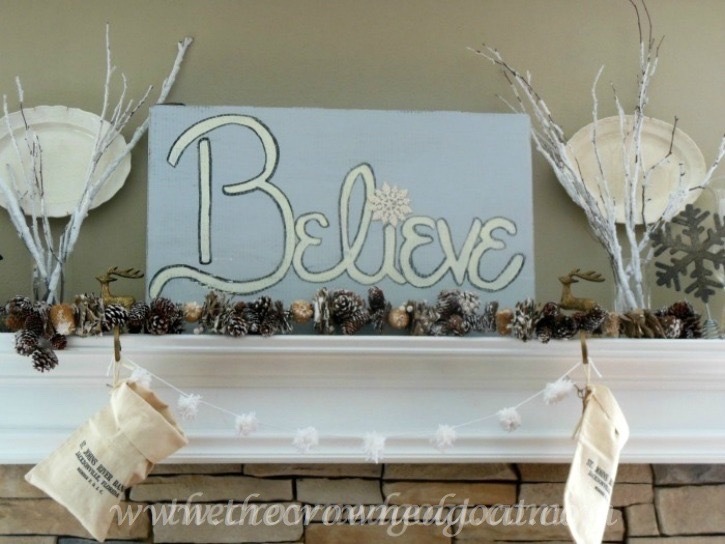 I made the “Believe” sign from an old TV box that I painted gray and free handed the lettering using black and white craft paint. 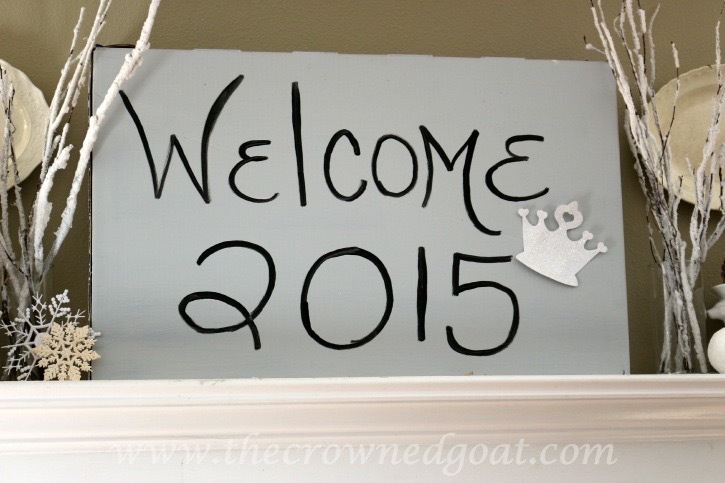 Since I had painted the entire box to use for the Christmas mantle I just flipped the box around and free handed “Welcome 2015” using the same black craft paint. I kept the snow inspired branches, the ironstone plates and the large candle in the glass hurricanes from the Christmas mantle. The lanterns were previously used on the table for the Lumberjack party. 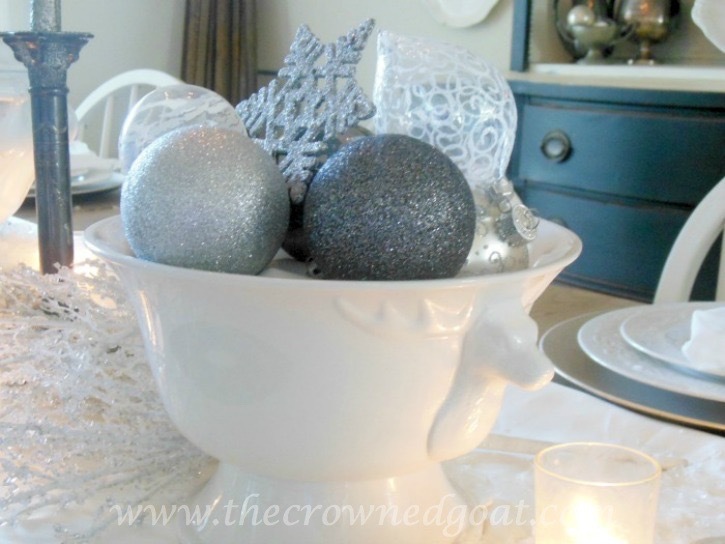 The white deer bowls now holding a candle and pinecones were previously used to hold glittering ornaments for holiday tablescape in the dining room. Did you recognize them? 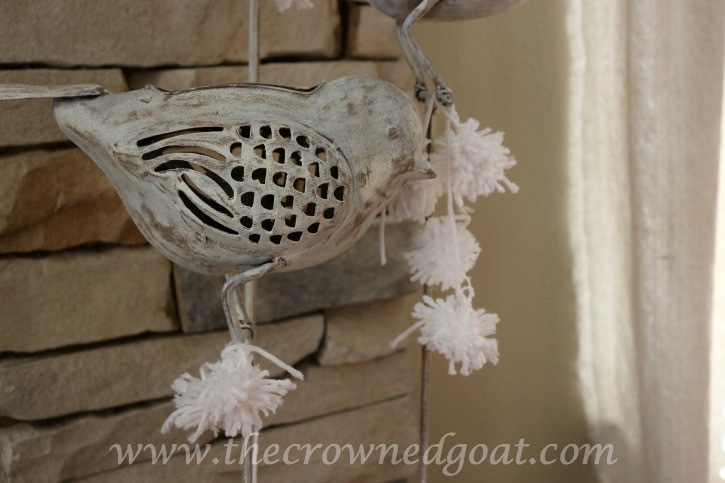 The pom pom garland was hanging from the stocking holders found a new home too. 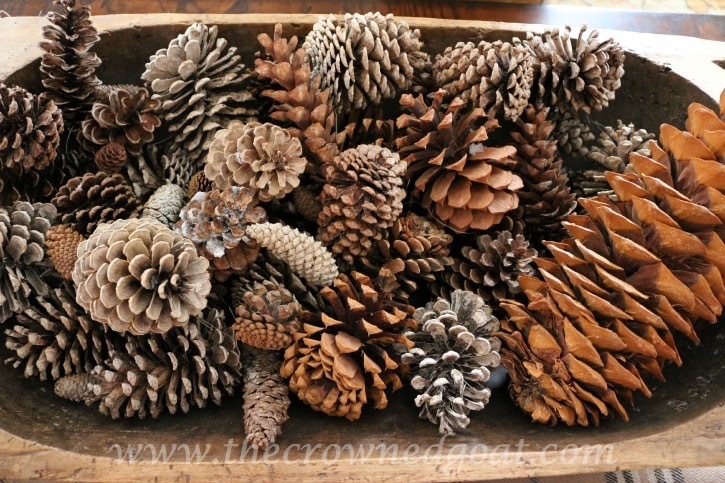 has been filled with pinecones. I replaced the plaid blanket that was under the dough bowl with a crochet blanket that my Granny made me. 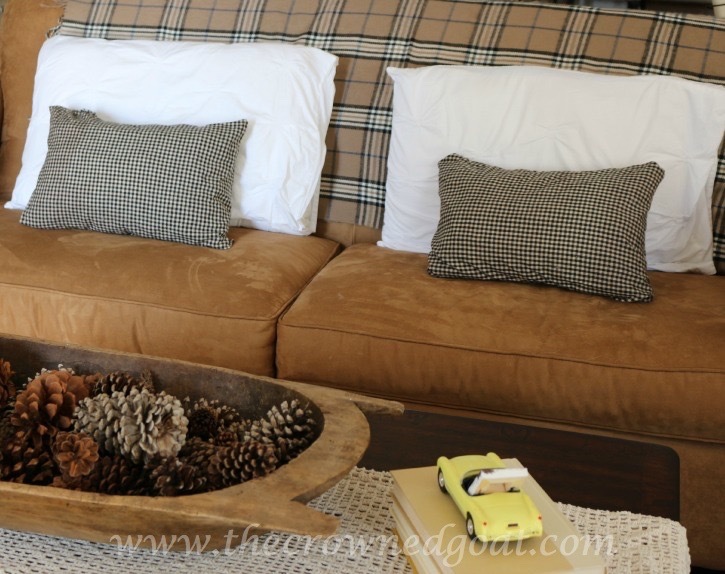 The plaid blanket found a winter home on the back of the couch. Once we took the Christmas tree down it left a big hole in the corner of the room. 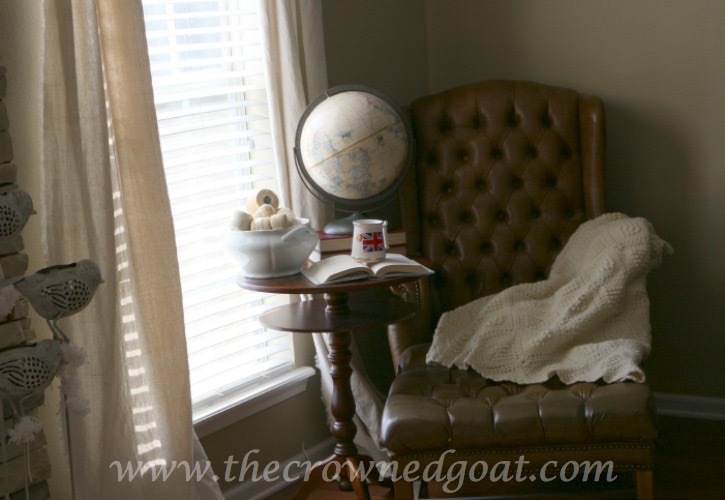 For now this vintage leather chair has become a little reading nook. The only look I’m after in the living room is cozy. I gave the dining room a quick update as well. 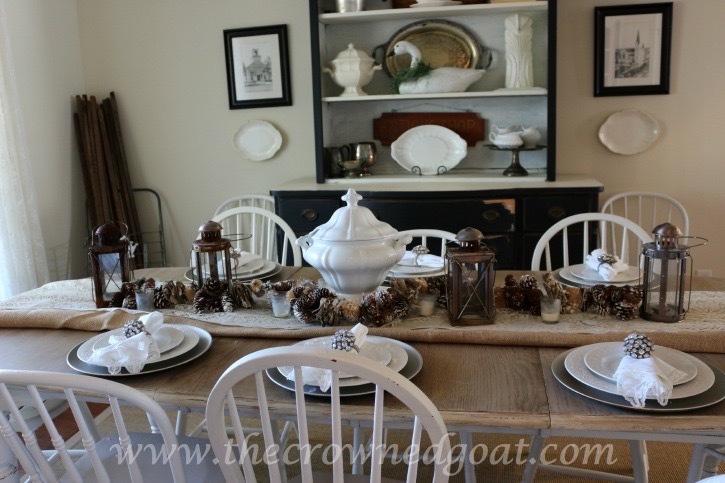 The pinecone garland that I bought on clearance at Michael’s a few years ago that was part of the Christmas mantle is now on the dining room table. 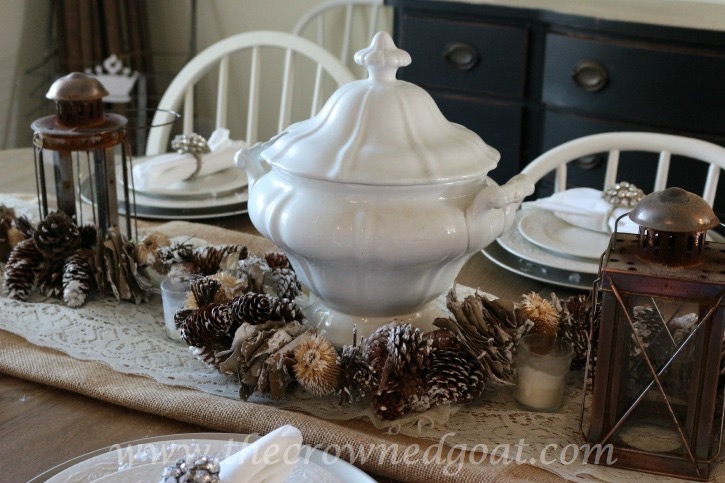 I kept the ironstone soup tureen and the place settings because I love them. To complete the look I added more lanterns from the party as well as layers of lace and burlap. I’m finding if I have the table set nicely, I’m less likely to pile thing on there. You know like the smalls that I’ve inventoried and need to take to my booth at The Pickers Market. See you guys back here tomorrow. After setting up the hot drinks bar outside for the party I wanted something just as awesome inside for every day! 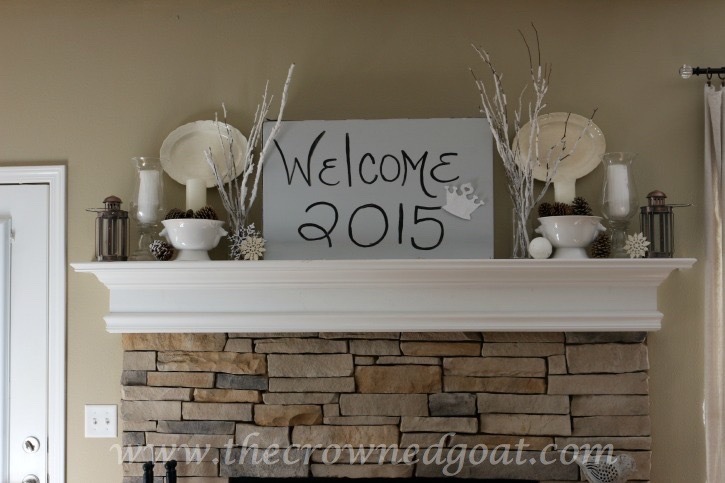 We do have such a soft spot for ironstone, Vicki! It’s like the ultimate equalizer in any room. Thanks for all of your sweet comments. Ok, making the Believe sign double sided, genius! All of your little changes look very cozy. Especially love your reading nook! You’re so sweet, Angie, thank you! It’s also about working smarter right 🙂 My goal is to keep that way of thinking up for the rest of the year!